Vancouver — What do you do when “the human race has suddenly encountered a deadly threat to its very existence” and carnivorous, alien plants are threatening to take over the world? The Vancouver community theater group will present their interpretation of the horror-comedy musical — popularized by the 1986 Frank Oz film starring Steve Martin, Rick Moranis, Ellen Greene and Bill Murray — at the Magenta Theater in downtown Vancouver, Oct. 7-22. 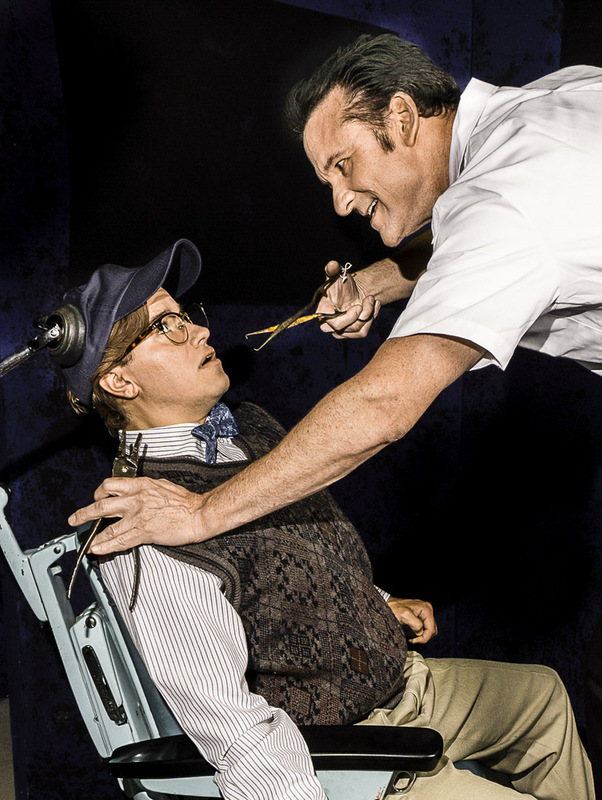 Caleb Bourgeois (left) as Seymour and Thomas Zalutko (right) as Orin in the Magenta Theater’s presentation of the horror comedy musical ‘Little Shop of Horrors.’ Photo courtesy of the Magenta Theater. 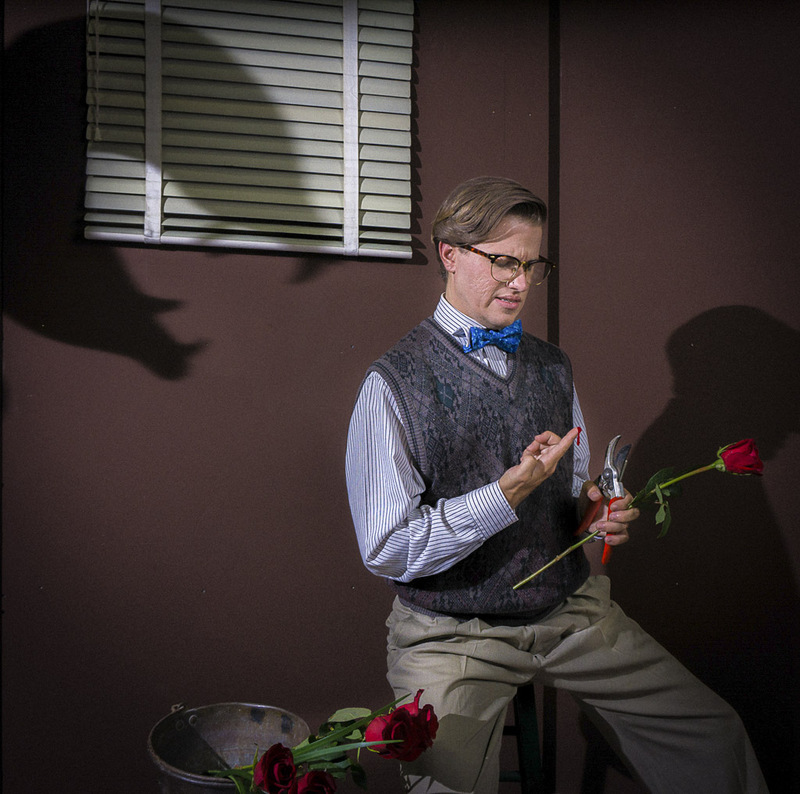 The dark comedy, which features a nerdy florist shop worker named Seymour who is raising a mean, green, human-blood-loving plant named Audrey II, is the first musical presented at the Magenta’s new theater space, located at 1108 Main St., in the heart of Vancouver’s downtown arts district. The community theater group took over their “new space” on Main Street in January of this year, and Roberts says they’re all thrilled to have a bigger stage, 60 percent more seating room, a spacious area in the basement for the actors and crew, and a reception area, where theater patrons can enjoy a glass of wine or a cup of hot coffee before the show. The space even has a small office for Roberts, who has been working without a true office space since 2002. 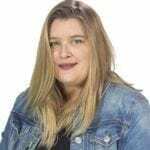 Although she has written plays with musical numbers before, Roberts says “Little Shop” is a first for her, too — the first “real musical” that she’s directed. Caleb Bourgeois plays Seymour, the nerdy and in-love florist shop worker who finds himself caught up in an alien plant pod’s scheme to take over the world in the Magenta Theater’s production of ‘Little Shop of Horrors,’ which runs tonight, Oct. 3, through Sat., Oct. 22 in downtown Vancouver. Photo courtesy of the Magenta Theater. Zalutko, a television and film actor who has appeared on shows like NBC’s “Grimm,” in several movies and in regional and national commercials, says acting on the stage gives him a chance to really hone his acting skills. Having only known him as his odd-walking, southern-drawling Bobby Dwayne, Roberts says she was a little surprised when Zalutko showed interest in the role of Orin — a character many people usually associate with Steve Martin’s over the top take on the violent, abusive, nitrous oxide-addicted character. “I didn’t even know if he could do something other than the southern accent,” Roberts says, laughing. “I’m originally from New Jersey!” Zalutko interjects. But, of course, he nailed the audition and has created a character that is not just a repeat of Steve Martin’s movie-version Orin. Instead, says Roberts, Zalutko has infused the character with an almost loveable quality — tough to do, considering that this is a sadistic, abusive guy. 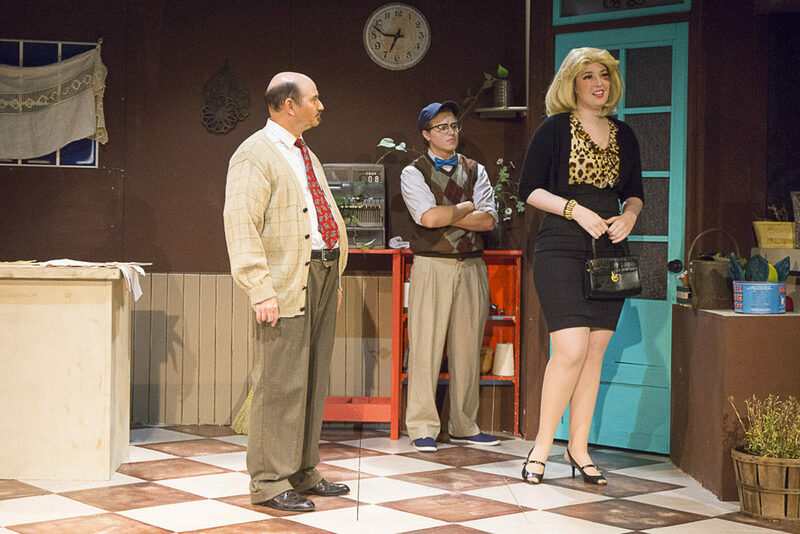 Other cast members agree that the Magenta’s presentation of “Little Shop” has challenged them in a good way. 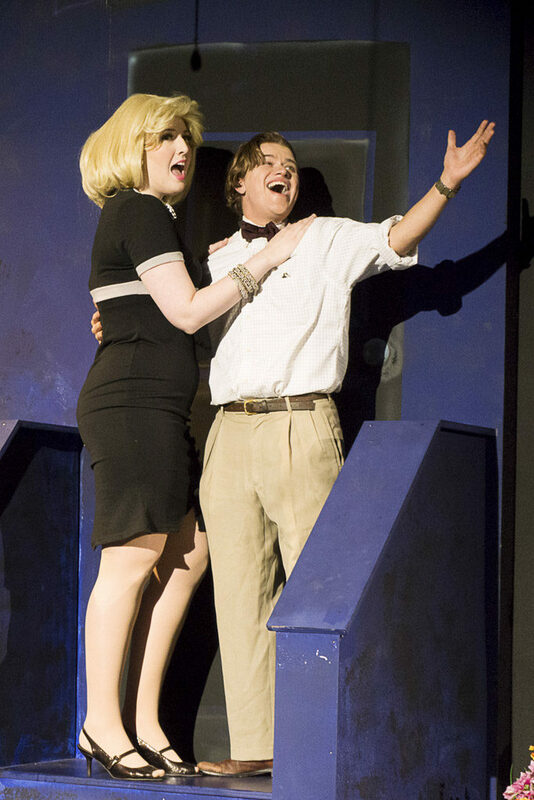 Actors Jaycelane Fortin (left) and Caleb Bourgeois sing the song ‘Suddenly Seymour’ in the horror comedy musical ‘Little Shop of Horrors’ at the Magenta Theater in downtown Vancouver. Photo courtesy of the Magenta Theater. Jaycelane “Jayce” Fortin, who plays Seymour’s love interest and Orin’s abused girlfriend, Audrey, says getting into character took some work. All of the main characters, including Caleb Bourgeois, who plays Seymour, say they tried to not watch other versions of the musical, including, of course the cult classic movie version. Having come from an arts-minded family — his dad, a New York actor, ran an opera company, his mother was involved with theater as well as the Anchorage Symphony Orchestra in Alaska and his grandfather used to play steel guitar with Johnny Cash — Bourgeois says being involved in theater is a natural fit for him. So, when his sister, Jacqueline “Beth” James-Bourgeois, decided to try out for a part in the Magenta’s “Little Shop of Horrors,” Bourgeois says he decided it might be fun to coach her and help her prepare for her audition. All of the actors say that working with the dedicated, volunteer-run Magenta Theater staff — especially with Roberts, their director — has been a unique and rewarding experience. Oh, and one final piece of advice from the director and cast? If you’ve only seen the movie version of “Little Shop” be prepared for a not-so-happy ending. The musical version uses the original ending, which is a little dark. To find out more about the volunteer Magenta Theater, which is currently looking for more patrons and donations to help pay down their building loan in order to bring more top-notch productions like “Little Shop of Horrors” to the Vancouver area community, visit their website. To purchase tickets, click here. Tickets cost $20 in advance and $22 at the door. The theater is located at 1108 Main St., Vancouver. Tony Provenzola (left) as Mr. Mushnik, with Caleb Bourgeois (center) as Seymour and Jaycelane Fortin as Audrey in the Magenta Theater’s production of ‘Little Shop of Horrors.’ The musical runs Oct. 3 through Oct. 22 at the community theater, located at 1108 Main St., in the heart of Vancouver’s arts district. Photo courtesy of the Magenta Theater.